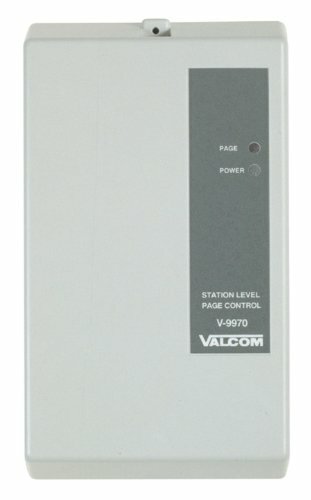 Valcom digital 1 zone one way page control. Full-featured paging from a PBx station, centrex, or standard CO line. Digital signal processing. Digital voice leveling. Enhanced feedback suppression. Extended frequency response music input. May be used with V-2003A or V-2006A for multi-zone paging. UL listed. VCV9970. Country of Origin: USA. Recycled Packaging: Yes. Type of Packaging: White Box. RoHS Compliant: No. Dimensions: 5"Lx3.5"Wx11"H. Weight: 2 lbs. If you have any questions about this product by Valcom, contact us by completing and submitting the form below. If you are looking for a specif part number, please include it with your message. SINGCALL Wireless Paging System,Display Unit for Wireless Keyboard,Call Waiter System for Self-service Pub. (APE1200) It Can't Be Used Alone! !